The fury of wild jumbos continues unabated at Indo-Bhutan border villages in Udalguri. 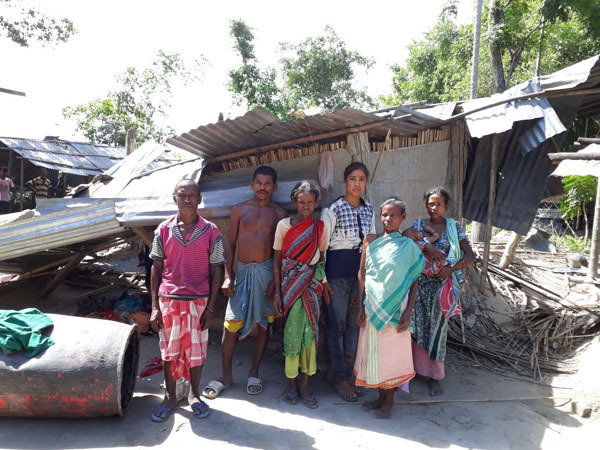 A day after six families lost their properties and crops in Saotal Basti in Uttar Garuajhar area under Nonai Forest Range of Udalguri, a herd of 80-100 wild jumbos damaged four houses in Guiha Basti in Uttar Garuajhar area belonging to Deben Kharia, Tanish Munda, Sumit Tigga, Karnilash Kerketa on Saturday night. Though, no one was injured in the attacks, the incident has cast a dark shadow over the victim families who find it hard to meet their daily needs. “The herd has been causing menace in the area after they descended from the hills in search of food. The elephants damaged houses and destroyed crops of several bighas in the area ” said Dibakar Nayak a nature lover in the area. The villagers have been spending sleepless nights for the last couple of days in fear of the elephants, he added. The forest department has also not been able to chase away the herd.